why does this kind of tragedy need to happen? I think this has been a wake-up call to all of us. We've been so sinful. We've abused our environment and we've taken God's gifts for granted. We just owe everything from Him so He has the right to take them away from us whenever He wants. Instead of getting mad, let's just take this disaster positively by considering it a learning experience. Yes, sometimes we just have to learn things the hard way. But what I am thankful about this incident is getting to know my fellow Filipinos better. We are indeed a happy nation. Despite all the sufferings, we still manage to smile. Also, the spirit of "bayanihan" has been proven alive! Everybody's helping the victims, and no one is being apathetic. It's really heart-warming to see the Filipinos helping each other, from saving/rescuing the stranded to distributing donations. *To all my friends who lost their homes in Provident, and those who got a lot of their properties damaged, don't give up. this is just a challenge. keep praying and be hopeful. my prayers are with you. 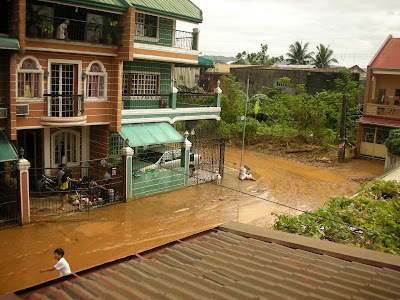 Same goes with the other victims of Ondoy.